A highly regarded urban public school educator in New Jersey for nearly 30 years, Baruti K. Kafele has distinguished himself both as a classroom teacher and as a school principal. As an elementary school teacher in East Orange, N.J., Principal Kafele was selected as the East Orange School District and Essex County Public Schools Teacher of the Year. As a middle and high school principal in East Orange, Plainfield and Newark, N.J., he led the transformation of four different schools, including Newark Tech High School, which went from a low-performing school in need of improvement to recognition by U.S.News and World Report as one of America's best high schools. Kafele is one of the most sought-after education speakers in North America. He is the author of eight books, including his four ASCD best sellers—Closing the Attitude Gap, Motivating Black Males to Achieve in School and in Life, The Principal 50, and The Teacher 50. He is the recipient of more than 100 educational, professional and community awards, which include the prestigious Milken National Educator Award in 2009 and the City of Dickinson, Tex., proclaiming February 8, 1998, as Baruti Kafele Day. 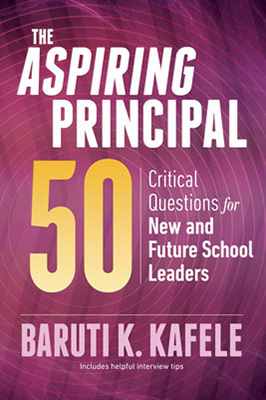 Baruti Kafele turns his attention the underserved audience of new and aspiring principals in a book designed to spark reflection about leadership potential and practices.